Growing up, I loved opening my lunch box and seeing one of those store-bought pudding cups inside. Vanilla was always my favorite. I would eat my lunch pretty fast, but savor each and every bite of creamy pudding. To this day, I still love light and creamy puddings and custards, but now, I make them myself. I like to “fancy” them up by serving them in pretty little jars or glass dishes topped with cream or fruit for a more decadent and luscious dessert. No more plastic cups with a foil top for me! This custard is one of my favorites. It’s light and silky with beautiful flecks of vanilla beans and a rich vanilla flavor. Topped with roasted berries, it is an absolute treat. Last week, I put one of these lovely little jars of custard in my lunch bag. I ate my lunch quickly and grabbed my little jar of custard. Although I ate my lunch at my desk, for a moment, I was transported to those simpler childhood days…me and my vanilla pudding. Aaaahh! For the Vanilla Custard with Roasted Berries recipe, click the link to follow me over to A Lucky Life blog. Wow these look great. Fantastic pictures! Yes, normally I make the caramel custard version (leche flan, right?) but adding fruit is a great way to mix it up, so to speak. And you’re right, very refreshing, too. 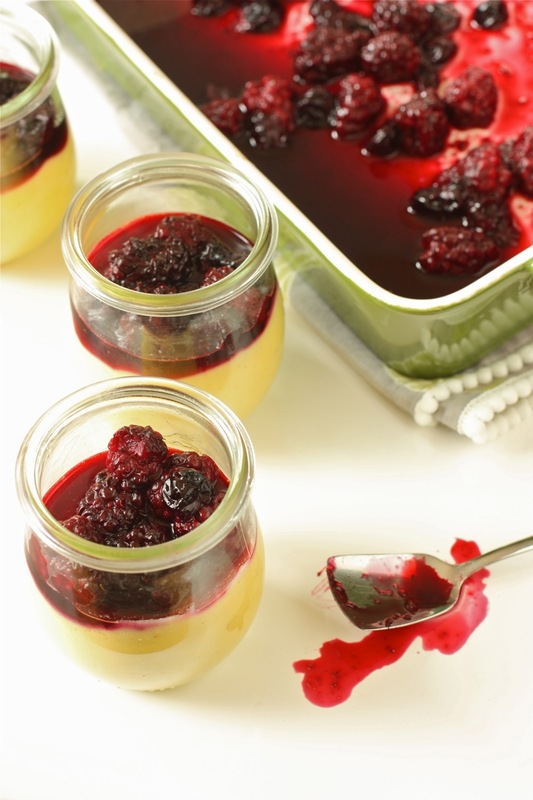 These look absolutely gorgeous and I love the sound of the roasted berries and vanilla custard combination – yum! Glad to see the writer’s block has passed. 🙂 Looks absolutely delicious. I have always loved custard…the smoothness and vanilla bean warmth. Usually, it is used as a filling and I joke that I could skip the rest of the recipe and eat the custard with a spoon. With this recipe, I am supposed to eat it with a spoon! I may even include the roasted berries because they look irresistible! This sounds like a wonderful dessert. I love your pictures! Thanks! These little desserts were really nice. This is so beautiful, Daisy! Love the cheery dessert! Thanks so much, Anna! We could always use cheery desserts, right? I LOVE custard desserts and these are absolutely beautiful! Gorgeous photos too, great post Daisy.